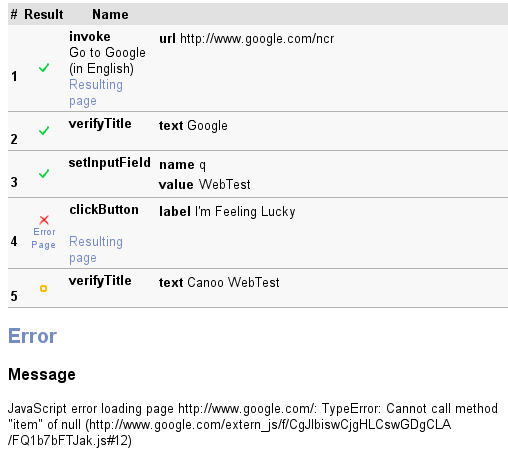 Like many other testing tools, WebTest uses Google‘s website for simple code examples. It has the advantage to be a well known website, pretty fast and with simple code. As this test used to work, this means that Google’s start page isn’t so simple any more that it used to be. It was predictable that this page would change one day but it is quite embarrassing as we use this kind of tests to show how easy and powerful WebTest is even for sites using a lot of JS stuff. http://www.google.com has really a JS error! HtmlUnit‘s JS support is quite good (and improved continuously), but of course not (yet 😉 ) as good as the one of “real” browsers, therefore I’ve started to search for the cause of the problem in HtmlUnit, looking for missing/incorrect implementation of some JS functionalities. At the end I’ve found that the problem occurred only when setting directly the value attribute of the field rather than calling the type(...) method on it because keypress handlers were being used. This means that WebTest should probably use type(...) rather than setting the field’s value directly. Rather painful for Google than for WebTest! OK, this error is nothing dramatical but for an Internet giant like Google that has plenty of talented engineers (and …, and…, and …. You perhaps know better than I what the web means for Google), I find quite painful to have such an error on its main page! The error scenario is not particularly complicated and such a case should surely be covered by automated tests. Perhaps is it a question of inadequate tools? Google seems to use intensively Selenium 😉 . Concerning WebTest, I’ll start the discussion on the mailing list to decide what is the best way to follow: setting directly the field value, typing it, or having both possibilities. I’ll give a presentation about efficient web test automation with WebTest at JUG Cologne on 25.08.2008. Thanks Michael for inviting me, it’s an honour to appear in the list of great speakers of my “home JUG”. There is no time limitation (according to Michael) therefore I plan to show different new demos of existing features as well as of future ones that should trouble / motivate / question the attendees. There will be a Lightning Talk on Selenium by Simon Tiffert before my presentation. I think that this will be quite interesting as well because Simon has far more experience with Selenium than nearly all persons blogging about this tool. Boost your WebTests: 50% faster or more! Tests never run fast enough! This is particularly true for functional tests of web applications. WebTest is known to be very fast compared to other functional test tools, nevertheless when your test suite grows or simply when you want to quickly receive feedback after a commit, you often feel that tests are too slow. A new experimental feature of WebTest allows to specify the number of threads that should be used for the tests what can bring enormous speed improvements without modification of the tests. The optimal number of worker threads will depend from the usage. The idea is quite simple and the implementation totally non-intrusive. In fact this is a shame that nobody has had the idea previously (including you! ;-)). This can be simply explained with a few lines of code. Once this is done, Ant can do its job normally. When it calls the execute() method of the task, the instance adds itself to a queue and the execute() method returns allowing Ant to continue its normal execution. A set of worker threads look at the queue, calling executeReally() on the WebTestTask instances to really run the tests. That’s nearly everything, the rest is just synchronization glue code. I’ve seen many cases where using a few threads allows to gain over 50% execution speed. In fact this will depend from the capacity of the application under test and how it can handle the increased charge. With a server – not necessary fast – that smoothly handles the charge generated by numerous worker threads, I can imagine tests suites that execute approximatively in the time of the slowest test. On the other side I’ve already seen test suites that take more time to execute with many worker threads when the AUT runs on the same physical machine than the tests themselves. It’s not really surprising: if the tests need more “power” to execute, then there is less for the application. With a recent WebTest build, you just have to specify the number of worker threads to start using this new feature. You many need to refactor your tests to include processing made after a </webtest> within the test otherwise this will be done before the tests itself gets executed and may be the cause of problems. Finally current implementation of this feature doesn’t contain any facility to manage dependencies between tests. Tests with large numbers of worker threads have shown that WebTest scales quite well: both memory and CPU usage stay correct. This opens a new perspective for WebTest: the usage as load testing tool. In fact it should probably be bound to something like JMeter but I see great advantages in WebTest usage compared to low level http processing as usually done by load testing tools, particularly in test maintainability, AJAX testing or for the correctness of the simulated scenario. Update (Feb 6): a former client told me that they just started to use a slightly modified version of this feature I prepared them for some time (allowing to manage some dependencies between tests). The results are even better as expected: over 75% saved time! With 8 working threads the tests complete in less than 25% of the original time. My colleague Tomi Schütz and I have finished our second WebTest screencast: Data driven WebTest. I- Do you know Google Calculator? II- Do you know the dataDriven Ant task? It should be interesting even for experienced WebTest users: the dataDriven task is so simple and powerful, and Google Calculator is a funny toy. What does it bring? In fact nearly nothing. It’s just a small information displayed during test execution. It becomes funny when you start a few dozen tests in parallel because you nearly don’t have time to follow each single test that get started or finished: it goes too fast. 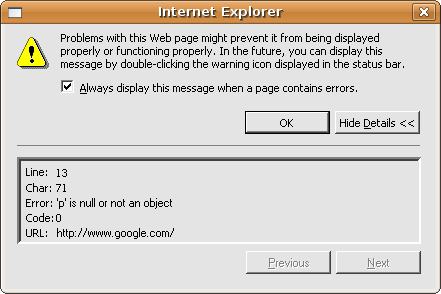 But this will be the subject of a future post once this feature is integrated in WebTest builds. In the last months I’ve seen a rising interest in automated testing of web applications thanks to the efficient viral marketing of Selenium. However, the world is full of test automation projects that started with big hopes and lots of enthusiasm only to be abandoned shortly after facing the unpleasant reality that it needs more than a point-and-click activity to develop a suite of robust tests. The maintainability of automated tests depends primarily on the skills of the test authors, but different tools have different features that impact their efficiency. This blog post compares the features of two open source automated web testing tools: Canoo WebTest and Selenium. Canoo WebTest is a free open source tool that has existed since 2001. It is written in pure Java and contains a set of Ant tasks that drive a simulated, faceless browser (originally HttpUnit, but for the last few years HtmlUnit). This is probably the most overestimated characteristic of a web testing tool. Automated tests don’t make manual testing useless because automated tests can’t cover everything (at least for affordable costs). You still have to walk through your application (just think of everything you’ve checked just reading this: page layout, font size, font colors, …). The consequence is that an automated web testing tool’s purpose is not to ensure that an application works “well” as it is not possible, but to detect most of the failures that could happen. This is a huge difference because it means that tests don’t have necessary to run in a “real” browser. JUnit-like reports are far too limited for web test automation. This is probably something that you first see when you have reached a certain volume of tests. If the tests are successful, you don’t need any report at all, but when some tests fail, you need the information to find as quickly as possible what is the failure cause and an error message is often not enough. With comprehensive reports like those provided by WebTest, you don’t have to debug your tests, just to analyse the reports. Furthermore it allows you to understand (and fix) the worst kind of bugs: those that don’t occur systematically. Tests are never fast enough. Selenium is known not to be very fast and even slower on Internet Explorer (just read the mailing list) and seems to suffer from memory leaks. On the other side, WebTest is quite fast (see for instance this thread in Selenium Dev mailing list for a non representative test where Selenium took ~ 10 seconds and WebTest < 2s). It’s not surprising due to Selenium’s architecture (3 tiers involved) and all the rendering that happens in browser. Even if HtmlUnit’s HTML handling algorithms are not as good as the real browsers, WebTest has simply less to do and everything happens in the JVM. WebTest is “just” Ant which means that it can directly be called from CruiseControl for instance or from each developer’s workstation. On the other side for Selenium you need a real browser with an own profile, a proxy – possibly on another computer if you want to test with IE and run the tests from a non Windows system. For a large application (or set of applications) with a good functional test coverage your test suite(s) will rapidly grow and scalability may become an issue. WebTest scales far better than Selenium mostly because it’s faster and because you can simply run many tests suites in parallel (just think of the hardware requirements and browser limitations to do that with Selenium). Beginners (as well as managers ;-)) better understand test automation of web applications, when they see what happens. Extensive and up-to-date documentation is very important. A quick look at both web sites will show you that WebTest manual is clearly the winner. It should even be a negative point for Selenium as advice on what makes test suites maintainable is completely missing. Should be a minimal requirement for a test tool, but if you look regularly at Selenium mailing lists or at different posts (like this one), this is not yet fully the case for Selenium. WebTest currently uses Jaxen as XPath engine which means that XPath 1.0 is covered as well as some XPath 2 functions (do you know that starts-with is in XPath 1 spec but ends-with first appears in XPath 2?). Additionally you can customize it to define your own XPath functions. Browsers are able to cope with really badly formed HTML code and so does Selenium as a consequence. WebTest’s parser (NekoHTML) is able to handle some malformations but not that much. Even though it is quite questionable to see it as a feature when your goal is to write your web application as well as possible, sometimes testers do not have access to the development resource to correct the source and just want to test functionality so I’ll give this point to Selenium. Selenium accepts custom extensions but first this is cumbersome because the extensions have to be deployed in the target browser(s) and second interactions are limited as extension code executes in the browser and not in your test program. In WebTest you have full control over the “browser” from within your tests which you can use to simply write global extensions as well as project or test specific ones. No discussion, the dataDriven Ant task used with WebTest is simple and powerful! Using WebTest, you just need to put your language specific strings in property files and use Ant’s built in property task to load the right resources before executing your tests. Dan Fabulich correctly indicates that Selenium RC tests written in the same language than the AUT can directly use the application’s i18n resource bundles. 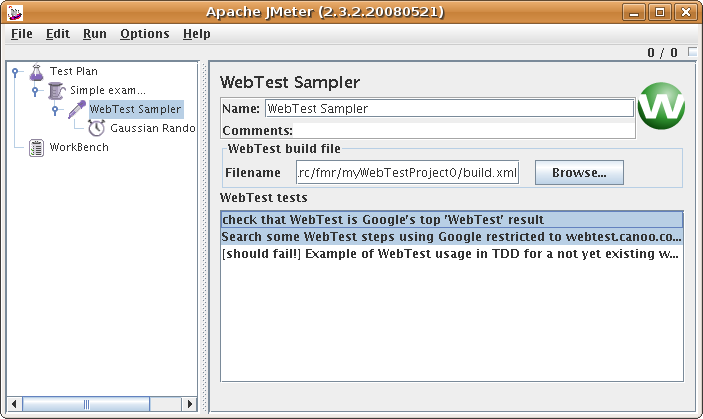 Therefore WebTest can’t be seen as winner outside of the Java world. HTML is only one of the content types used by a web application and it’s a common need to have mixed content within the same applications with for instance a PDF file containing the invoice after the checkout. Selenium is limited to HTML content (+XML and text). On the other side WebTest has built in support to work with PDF documents and Excel files as well as Applets and Emails. Automated functional tests of web application should become as natural as unit tests. Some tests are better than no tests, no matter which tool is used. Selenium does a good job to introduce newcomers and has many advantages (besides the price) over its commercial model QTP. Nevertheless at least when the size of your suite grows, you should pay attention to your efficiency if you want to last and “the ROI on WebTest is many orders of magnitude higher than any other tool I’ve used” (Lisa Crispin, author of Testing Extreme Programming). When I started writing this post I didn’t expect that Selenium would get such a bad score. Comments are welcome to show which advantages of Selenium over WebTest I’ve missed!